The Akamai Workforce Initiative, a local program dedicated to advancing Hawai‘i college students into science and technology careers, has announced the latest class of students for its 2017 summer internship program. With lead funding from the Thirty Meter Telescope, the Akamai Internship Program provides community college students and undergraduates with summer projects at observatories and other high tech companies in Hawaii. All 29 students are from Hawaii or enrolled at a University of Hawaii campus. The students receive credit from University of Hawaii Maui College, and began on June 12, 2017 with a preparatory course taught by Akamai instructors. 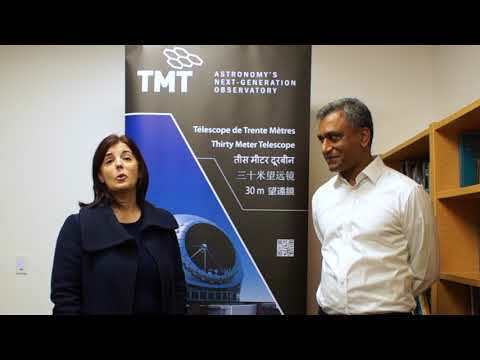 They will then complete a seven-week project at various observatories and facilities on Hawaii Island, Maui, and in Pasadena at the TMT project office. The Akamai Workforce Initiative is designed to build tomorrow’s high-tech workforce by providing support to local college students over a broad range of science, technology, engineering and mathematics (STEM) fields. Each student is matched with a mentor and is integrated as a member of the mentor's group with daily guidance. Akamai mentors are prepared to provide an experience that will support their intern’s persistence in STEM, while they complete a real project valued by their host organization, through a unique workshop offered in May. The careful attention to mentoring, the preparatory course, and an ongoing communication course, are all important elements of the program and have been attributed to the program’s success. Since launching in 2002, nearly 330 college students have participated in the Akamai program and at least 140 alumni are now working in science and technology jobs, with nearly two-thirds of them working in Hawaii and contributing to the local STEM workforce. Akamai accepts college students from Hawaii (80% graduated from a Hawaii high school or were born in Hawaii), and a key objective is to increase the participation of underrepresented and underserved populations in STEM. So far, the Akamai Workforce Initiative alumni demographics include 36% women, 25% Native Hawaiian, and 47% underrepresented minorities. To learn more about the summer internship program, go to www.akamaihawaii.org.